Use half the effort with SandTrakz wheels. C-Tug® by RAILBLAZA® offers easy transportation of kayaks and canoes over a wide range of surfaces with the C-Tug®C-Tug SandTrakz All-Terrain Kayak and Canoe Cart. 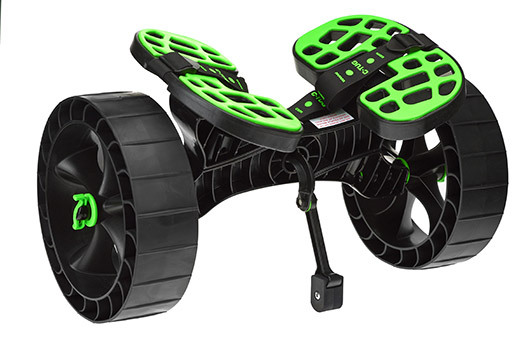 Sturdy and compact, the kayak cart features puncture-free, tubeless compression wheels that flatten to create a longer track length for more surface contact, and to prevent sinking in soft surfaces. Constructed of high-strength fiberglass-filled plastic with a compression rubber tread, C-Tug SandTrakz All Terrain wheels use the same design technology employed by tanks and bulldozers. The outer rim compresses under use and elongates the track length for maximum surface area contact to stay on top. This decreases the amount of effort needed by half when compared to standard Kiwi wheels. Rated for 180 pounds, the C-Tug SandTrakz All Terrain easily handles any kayak on the market and transitions from soft to hard surfaces effortlessly. Complete with heavy-duty straps and an aluminum cam lock buckle, the C-Tug SandTrakz All Terrain is fully adjustable to accommodate any kayak hull shape. The compact design easily breaks down for quick storage inside a kayak hatch or on the deck. The Double Up Bar from C-Tug allows paddlers to combine two C-Tug carts to transport extra-heavy kayaks and small boats up to 350 pounds. 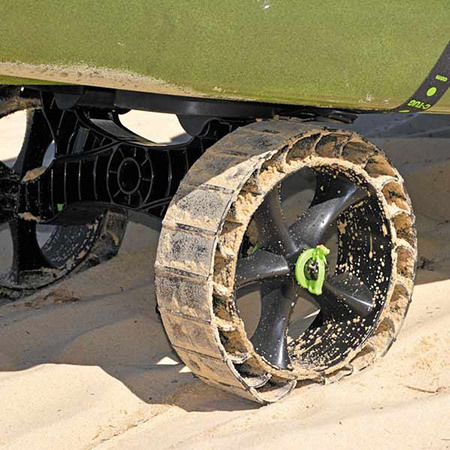 Designed to be a specific length for optimal turning, the Double Up Bar with two C-Tugs can also be used to haul heavy ice chests or fishing gear for fun family days on the beach or pier. C-Tug is owned by RAILBLAZA, a manufacturer of paddlesport and marine accessories, which are exclusively distributed in the U.S. by RAILBLAZA USA. For more information about C-Tug and RAILBLAZA products, go online to RAILBLAZA.com. RAILBLAZA, a manufacturer of paddlesports and marine accessories, is exclusively distributed in the U.S. by RAILBLAZA USA. For more information about and RAILBLAZA products, go online to RAILBLAZA.COM. Follow RAILBLAZA social media outlets at facebook.com/RAILBLAZAUSA, youtube.com/user/RAILBLAZA and on Instagram @RAILBLAZA.